Function: 3D rollover,Camera,Forward/backward,FPV,Gravity Sense Control,Headless Mode,One Key Automatic Return,One Key Taking Off,Sideward flight,Turn left/right,Up/down,WiFi Connection,With ligh. ✈✈✈ The Gravity Sensor Mode enables the small quadcopter to automatically follow the way you move your smartphone. /Two remote control ways are available,RC control mode and gravity control mode. 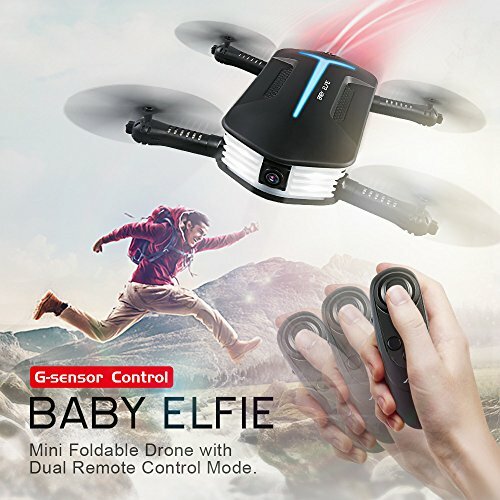 ✈✈✈ Innovative selfie drone,720P camera allows you to get great selfies effortlessly. /Wifi real-time transmission FPV system which can capture photos and record videos for your great memory. ✈✈✈ Built-in barometer with altitude hold function provides stable flight. /Mobile phone WiFi control, FPV by mobile phone screen. /With trajectory flight mode, you can plan your fight plan. /With attractive headless model, completely solving pilot loss-of-orientation problem. / One press automatic return ensure that you can call back your quadcopter without any delay. ✈✈✈ 4 Channel which can do ascend, descend, forward, backward, left sideward fly, right sideward fly and rolling 360° / It has 6-axis gyro which can have more stable flying and be easy to control / 3D flips with amazing agility provides a stunt aerial show.